PFC Jesse Hopinkah (1921-1949) was a member of and served in the First Special Service Force (FSSF) during World War II. 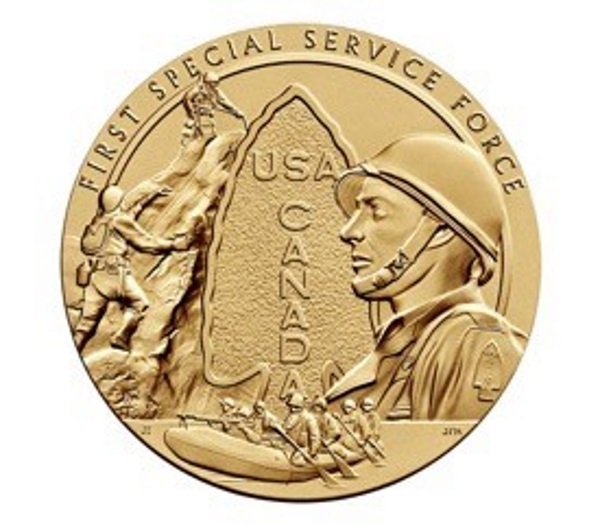 The FSSF was an elite American-Canadian Commando Unit under the command of the U.S. 5th Army. Today’s American and Canadian Special Forces trace their heritage to this Unit. The Unit was organized in 1942 and trained at Fort Harrison near Helena Montana. Troops went through a rigorous selection process and only a few were chosen. The Unit’s specialty was close quarter fighting against superior numbers. They became paratroopers and had their first jump within 48 hours of training. Additional specialized training included mountain warfare, amphibious landings, psychological warfare, and proficiency in non-standard and enemy weapons. Initially referred to as the “Braves”, the official Unit shoulder insignia patch was a red spearhead with the letters USA and Canada in white. Their collar device was the crossed arrows, a symbol used on the uniforms of the U.S. Army Indian Scouts. The FSSF, served in the Aleutian Islands, and fought in Italy and Southern France. The U.S. Army Special Forces Groups, the lineal descendants of the FSSF, celebrate Menton Day every Dec 5th marking the day the Unit was disbanded in Menton France in 1944. In 2013, Congress awarded Jesse’s Unit the Congressional Gold Medal for superior service during WWII. Jesse’s awards also included the Bronze Star and Purple Heart. To honor my Tega Jesse Hopinkah, for Veterans Day 2018, as a founding sponsor of the National Museum of the U.S. Army, currently under construction near Washington DC, I had his name and service information added to the Museum’s Registry of the American Soldier. The Registry will be prominently displayed at the National Museum of the United States Army and available for viewing online. I have also sponsored and purchased a commemorative brick in his honor at the National Museum of the U.S. Army. The brick will include his name, Unit, and that he is a Ho-Chunk Tribal member. These commemorative bricks will to be used to “Pave the Way to Army History” on the “Path to Remembrance” leading to the National Museum of the U.S. Army’s main entrance.